In its capacity as the coordinator of the FOOD program (Fighting Obesity through Offer and Demand), in 2018 Edenred surveyed more than 25,000 employees and 1,400 restaurant owners in eight European countries (Austria, Belgium, Czech Republic, France, Italy, Portugal, Slovakia, and Spain) on the subject of eating during the working day. The seventh FOOD barometer survey has highlighted a number of trends: the sharp increase in demand for healthy and balanced meals, the increasingly important role companies could play in order to improve their employees’ well-being and the interest generated by technology to encourage healthy eating. 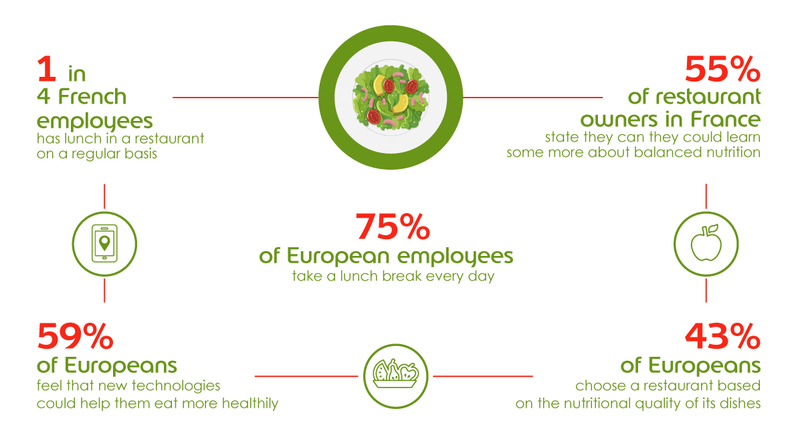 According to the FOOD barometer survey, almost 75% of Europeans take the time for a lunch break (+5 pt since 2014), although 27% of them often eat at their desks. 94% of Belgians regularly eat at their workplace whereas in France the midday break is sacrosanct. Indeed, 26% of French employees go out have lunch in a restaurant regularly, with proximity and price being the key factors, as is the case with 39% of Italian employees and 34% of Slovakian employees, who eat at a restaurant to take advantage of the healthy, freshly cooked food. One of the main changes seen since the launch of the barometer survey, is greater awareness of the importance of a healthy and balanced diet, even during working hours. In 2013, only 28% of Europeans chose a restaurant based on healthy menus; today 43% pay attention to eating a healthy diet (+15 pt). This criterion is even more important in Austria, where 49% of respondents state that healthy menus are very important when choosing an eatery. In an ever more connected world, can new technologies help us eat more healthily? The answer here is ‘yes’ for 51% of European employees, convinced that new technologies can help them to achieve a more balanced diet. Nevertheless, disparities exist between the various countries, as only 41% of French employees state that the use of a mobile application would help them improve the quality of their diet while this figure reaches 62% in Spain. The wish to eat more healthily is also being accompanied by another trend: employees feel that their employer should contribute to their well-being. Today, 72% (+43 pt since 2016) of European employees feel that a company should help its employees eat healthily and improve well-being at work via various types of initiatives, such as fruit baskets for example. A total of 33% of employees would like to have access to a network of restaurants offering balanced menus. 60% of European employees also feel that the company could contribute to their well-being by providing access to sports centers for staff, with this figure rising to 72% in France. The restaurants are naturally the first to observe these new trends. In Spain, 69% of restaurant owners have noted a higher demand for balanced dishes in comparison with 2017. To keep pace with this new demand, restaurant owners are providing more information and training, and adapting their menus. Today, 55% of restaurant owners in France state they can they could learn some more about balanced nutrition. Faced with the emergence of new technologies 41% of European restaurant owners feel that new technologies could help them in the preparation of new healthy dishes, compared with 39% last year. However, the barometer survey has revealed disparities between the various countries. In the Czech Republic only 27% of restaurant owners feel that new technologies could help improve their cooking habits while 66% of them are of this opinion in Portugal. “Health stands at the heart of everyone’s concerns and food is one of its crucial pillars. It is interesting to observe how much employers and employees are actually aware of this fundamental aspect of well-being. Restaurant owners’ offer is increasingly meeting the high demand of consumers who often decide where they will have lunch based on nutritional quality. Lunch break is no longer a mere break in a workday; it is a way of treating yourself to a savory, balanced, and invigorating dish,” confirms nutritionist Sylvie Dejardin.